Choose your hours, choose your work, be your own boss, control your own income. Welcome to the sharing economy, a nebulous collection of online platforms and apps that promise to transcend capitalism. Supporters argue that the gig economy will reverse economic inequality, enhance worker rights, and bring entrepreneurship to the masses. But does it? In Hustle and Gig, Alexandrea J. Ravenelle shares the personal stories of nearly eighty predominantly millennial workers from Airbnb, Uber, TaskRabbit, and Kitchensurfing. Their stories underline the volatility of working in the gig economy: the autonomy these young workers expected has been usurped by the need to maintain algorithm-approved acceptance and response rates. The sharing economy upends generations of workplace protections such as worker safety; workplace protections around discrimination and sexual harassment; the right to unionize; and the right to redress for injuries. Discerning three types of gig economy workers—Success Stories, who have used the gig economy to create the life they want; Strugglers, who can’t make ends meet; and Strivers, who have stable jobs and use the sharing economy for extra cash—Ravenelle examines the costs, benefits, and societal impact of this new economic movement. 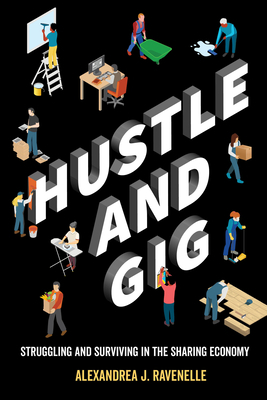 Poignant and evocative, Hustle and Gig exposes how the gig economy is the millennial’s version of minimum-wage precarious work. Alexandrea J. Ravenelle is Assistant Professor of Sociology at Mercy College and Visiting Scholar at the Institute for Public Knowledge at NYU.